Magerealm, our stunning 3D action MMORPG, has a new Angel to announce! Introducing Virgo, the Keeper of Lore! Learn more about this living vessel of knowledge and wisdom below. Few are as respected among the Angels as Virgo. While she is not known for valors on the battlefield, none can argue the importance of her role to the entire Angel race. Stored within her is the vast knowledge and history accumulated by the Angels since their creation. Virgo is as meticulous as one would expect from the holder of all knowledge. Befitting of her name, no detail is too small for Virgo to recall. Her approach to everything is always organized and methodical, making her highly reliable and the perfect Angel to act as the Keeper of Lore. Virgo’s battle skill, Whisper of Lyre, is a powerful buff that provides the ultimate protection for your team. 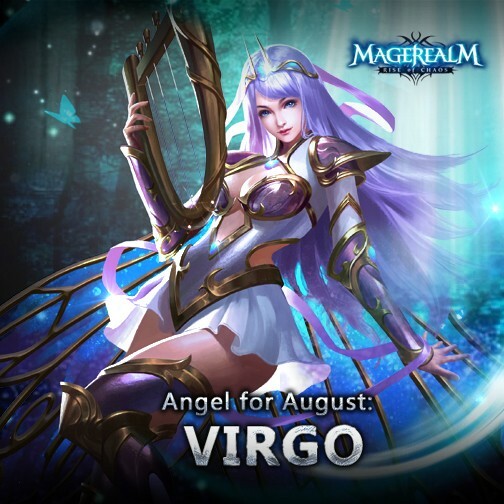 With her enchanted Lyre, Virgo bestows an extremely durable shield on her allies that can absorb heavy damage. At the same time it also buffs their attacks so your team can strike back with a vengeance. Use all the knowledge and wisdom of the Angels to your advantage with Virgo! Join Magerealm today and play the best action MMORPG on this side of the Realm! Follow Magerealm on Facebook or GTArcade for free now, and visit the official forums to get the latest news and participate in rewarding events.